It was not a perfect evening for Frankfurt against Wolfsburg on Saturday. 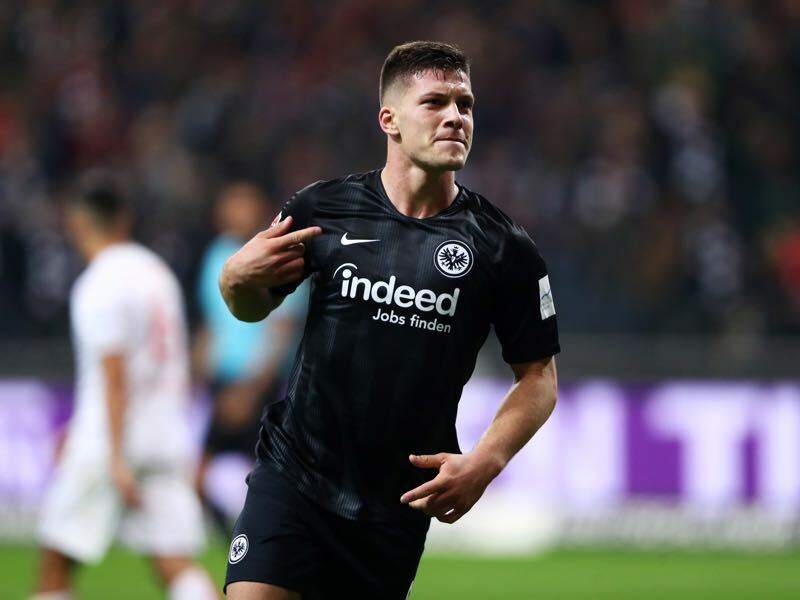 Even though Luka Jović scored his tenth goal of the season, Eintracht Frankfurt would ultimately lose 1-2 against die Wölfe. Nonetheless, he is one of the biggest stories of the year in the Bundesliga thus far. The Eintracht Frankfurt forward has set Germany on fire scoring ten goals and four assists in 11 Bundesliga games this season. Jović’s performances, in fact, have already drawn comparisons to the likes of Monaco forward Radamel Falcao. “Luka Jović is going to ‘explode this season, he is going to be the Serbian Radamel Falcao,” his Crvena Zvezda general manager Zvezdan Teržić said in 2014. Things, however, wouldn’t be quite that simple for the Serbian striker and it would take some time until he would draw comparisons to Falcao outside of Serbia. Developed by the prolific Crvena Zvezda youth academy Jović had all the talent to be an excellent forward. But at the same time, he also played for a club desperate for money. The Belgrade side had sold his transfer rights to an agency that belongs to the Israeli player agent Pini Zahavi. Zahavi has been recently in the news as part of Der Spiegel’s Football Leaks investigation. The Israeli player agent has had his hands in various transfers on the Balkan peninsula and in Jović’s case purchased the rights to the players in secret deal and transferred the player to Apollon and then loaned the striker back to Crvena Zvezda. In January 2015, the talented Serbian striker Luka Jović moved from Red Star Belgrade to the Portuguese club Benfica Lisbon. Contract details exposed by Football Leaks on April 17 2016, however, showed that Jović’s contract had no longer been the property of Red Star but was instead owned by the Cypriot club Apollon Limassol. According to the contract, Benfica paid €7 million in five instalments of €1.25 million—it has been widely believed that Benfica paid just €2.2 million for the transfer of the striker. It was a typical Balkan transfer that was not designed to help the player’s development or the club that developed him but instead fill the pockets of agents and club officials. Luka Jović, in the meantime, struggled to make the next step of his development at Benfica. The Portuguese side mostly employed Jović at their development team in the Ledman Liga Pro. In his one and a half seasons with Benfica, Luka Jović played just four games with the first team. Not a great for a player, who in 48 games as a teenager for Crvena zvezda had scored 13 goals and four assists. His development had stalled at the Portuguese side – and the Águias were looking to send the Serbian out on loan. This is where Eintracht Frankfurt sporting director Fredi Bobić comes in. Although a former German national team player Fredi Bobić was born in Maribor, Yugoslavia, and his heritage as well as a stint as a sporting director at Chernomorets Burgas means that Bobić is well connected in Southeastern Europe. Bobić also knows how to cut a deal. In the summer of 2017 Bobić negotiated a deal that saw Luka Jović join Eintracht Frankfurt on loan for €200,000 but also included a loan to buy option of €6 million. In other words, it was a typical Bobić deal – the sort of deal that also allowed Frankfurt to sign Ante Rebić for just €2 million from Fiorentina. Now one and a half years later it seems almost certain that Frankfurt will exercise their option to complete the transfer for Luka Jović. It might turn out to be the steal of the century. When the club signed the loan agreement Jović’s transfer value was €2 million, now in December 2018 transfermarkt.de evaluate the player to be worth €20 million. Furthermore, given the development on the transfer market in general Jović’s transfer value might be already manifold of the €20 million estimated by transfermarkt.de. In fact, as Luka Jović keeps on scoring more and more stories emerge about clubs showing their interest in the 20-year-old Serbian, who was born in the Bosnian town of Bijeljina. One of those clubs are German giants Bayern München, who will likely be undergoing a major rebuild in the summer. Given the prolific season, Luka Jović has it is no surprise that the big clubs have once again started to take notice of the 20-year-old. Bobić described Jović as an “incredible box player.” Jović is a terror for any defensive line and runs into spaces that most players are not aware of. His intelligence allows him to see situations develop and to use them to his advantage. Those observations are underlined by some key statistics. When looking at Jović’ heat map, it becomes quickly apparent that the striker spends the majority of his playing time in between the penalty spot and the six-yard box or alternatively about five yards outside the 18-yard-box. It is the prime hunting area for deadly strikers. What sticks out when looking over Jović’s statistics this season is the fact that despite an xG of 0.58 he has currently averaged 1.19 goals per 90 minutes. Another interesting aspect is that he completes just 48.4% of his on average 59.92 total actions per 90 minutes. Those are not top numbers but also not untypical for a pure goalscorer. Second in goals and assists, just behind teammate Sébastien Haller (15) with 13 Luka Jović ranks only 13th in the league with 4.86 expected goals. In other words, Luka Jović manages to convert chances even from difficult situations. It is that attribute, in particular, that makes him such a dangerous proposition a forward that scores when it is the least expected from him. It is the sort of attribute that made Radamel Falcao a rare commodity when he was at his peak and also defined former German national team striker Miroslav Klose. It is the trademark of a true all-out striker, an attacking weapon that can not be shut down by the opposition. Pair that weapon with fellow attacking players like Sébastien Haller and Ante Rebić and you got a recipe for disaster that can turn an opposition inside out. Hence, although Frankfurt ended up losing that match against Wolfsburg plenty can be expected from the Eagles this season – especially as Luka Jović does not seem to stop scoring anytime soon. As a SL Benfica supporter, it is sad to realise how we dealt with his case. Here, in Portugal, people often refer to that as an example of bad management from the team, as well as it had happened with Bryan Cristante (now, shining at AS Roma). On the other end, Jovic has recognized himself as being immature, during the his stay at SL Benfica, and that didn´t help him to settle to the team.